The Australian Cancer Research Foundation is a charity dedicated to speeding up the discoveries that will benefit patients with all types of cancer. Our ultimate goal is to end the devastating effects of cancer. Since 1984, we have awarded nearly AUD $130 million to world-class cancer research projects. $2M to establish the ACRF Tumour Heterogeneity Program to learn more about the mutation, internal variation, location and the impact of time on the growth and treatment of tumours at the Victorian Comprehensive Cancer Centre. $2.5M to establish the ACRF Tumour Metabolism Laboratory at the Centenary Institute, NSW, to determine the differences in nutrient metabolism by cancerous and normal cells to improve cancer treatments. $2.3M to establish ACRF Cancer Ultrastructure & Function Facility and to provide microscopes that can see cancer cell behaviour and their response to drugs in order to stop the spread of cancer at the Institute for Molecular Biosciences, University of Queensland. $1.2M to establish the ACRF Blood Cancer Therapeutics Centre to develop a national program to improve patient outcomes for multiple myeloma and acute myeloid leukaemia at Monash University and Alfred Hospital, Victoria. Each year our highly regarded Medical Research Advisory Committee makes recommendations to the Board of Trustees of ACRF as to where grants could be awarded. The projects we fund have worldwide impact: we are the group who funded Professor Ian Frazer’s research into the cervical cancer (HPV) vaccine when no-one else would. 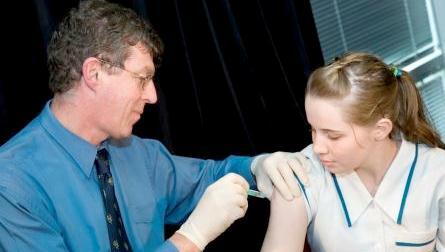 Prof. Ian Frazer gives the world-first cervical cancer vaccine in 1996. And, we know that the more research we fund, the sooner new treatments and cures for cancer will be realised. On behalf of world’s leading cancer researchers, we thank you, our donors and supporters. It is your generosity that makes it possible to provide these major grants – we receive no funding from any other sources.